Home Sheducation Centre Looking for a Custom, Quality Patio? Look No Further! If you’re looking to build something to shade machinery, large equipment, or anything else, or just to give a home to your workshop, then meet Action Sheds Australia, a great provider of machinery sheds in WA. We bring to the table phenomenal sheds, garages, workshops, and patios. In fact, our patios are a spotlight, being somewhere between a full shed and a small carport and great for roofing large items or equipment. 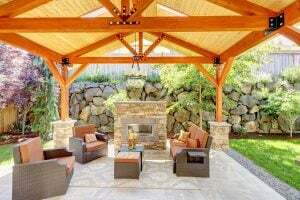 All of our storage sheds and patios are custom designed, meaning that you pick the dimensions. Courtesy of our approachable staff, we offer a variety of options for you to choose from, on how to form your perfect patio and we will help you through every stage of the process. The metal used in our patios can be either by Colorbond or Zincalume, both excellent makes that use Bluescope sheeting material. Design-wise, roofs come in both skillion, or flat, and gable, or more pointed styles. We also offer a few other optional extras, including gable infills, multiple sheeting profiles, and ridge vents, for extra airflow support. A variety of different colours are also available for our patios. We have an abundant assortment to choose from, ranging from the lively manor red, to a fair cottage green, to the simple off-white surfmist, to the earthen tone of sandbank. All of our patios and other storage sheds are backed by a ten year warranty on the structure of the sheds and ports and a fifteen year cladding warranty, which includes the coloured sheeting. We take great pride in the fact that our patios and storage sheds are of the highest safety rating in the nation. Normally, our patios come in kit form which you can construct at will, but we do also offer services by our experienced technicians to build the patio for you, wherever you may be. We are able to also ship these kits or transport them directly to you, anywhere in the country. This makes us not only among the best sheds in Perth, but on a national level as well, as we provide to all of Australia. For any additional questions you may have about our patio options, construction, and delivery, call us at 1300 778 628.